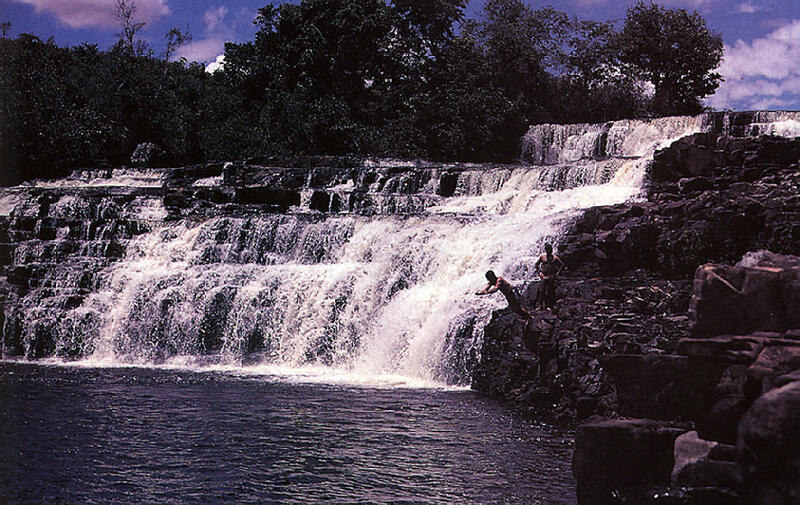 A vast land of forest and mountain, river and waterfall, Guyana is developing a kind of tourism new to the Caribbean. A toucan nibbling gently at my big toe was a new experience. I didn’t fancy his chances of swallowing it, but he seemed determined to have a go. I had not expected to be a toucan’s breakfast. But then, a week in Guyana turns up quite a few surprises. Arriving in Guyana has a familiar Caribbean feel about it – the suitcase ladies (huskers in Guyana) with their unmanageable piles of luggage, the lively line of taxi-men and the mini-buses throbbing to Jamaican dub — but soon the impressions change. Guyana is blanketed with fifty feet of unfamiliar bush; wooden houses stand high on stilts. Instead of mountains pushing down to the coast, the flat lands are cut by vast, slow-moving rivers with exotic names: Berbice, Demerara, Essequibo. 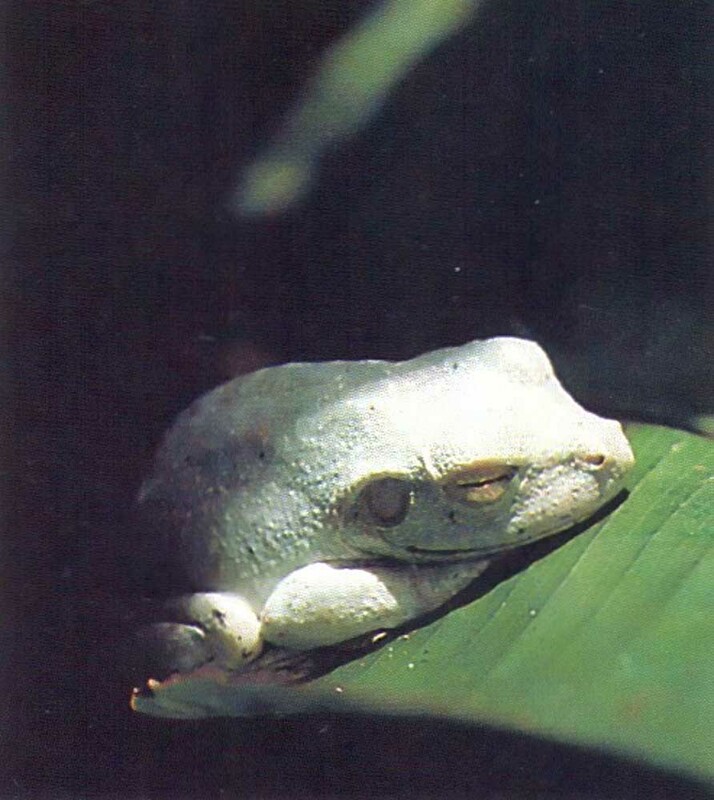 And the night call of the frogs and insects is different too. There is a continuous ringing, instead of the rhythmic Antillean peep. It is a mesmeric and sleep-inducing chorus after a long day’s travelling. It was at breakfast the next morning that Toukie the toucan started sizing up my toe. 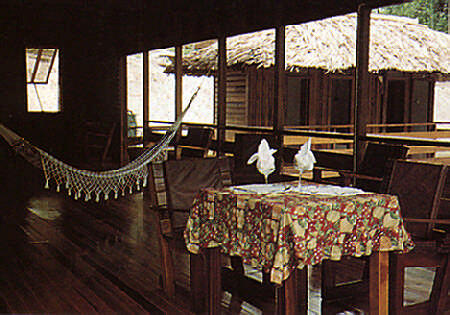 We were sitting on the veranda of one of Guyana’s new up-country retreats, the Emerald Tower. 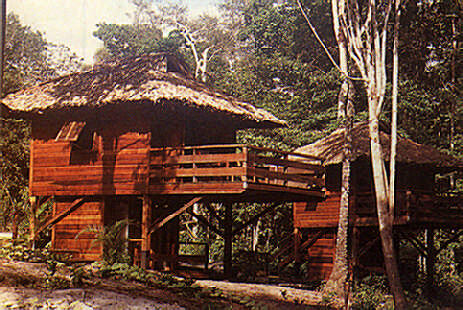 Standing above a creek deep in the bush are eight palm-thatched cabins scattered around a pyramid-roofed central building which has a huge veranda slung with hammocks and set with solid chairs. It is a real pleasure to stay in a place built entirely of local wood –beams, columns and board after board of highly-polished Guyana greenheart. 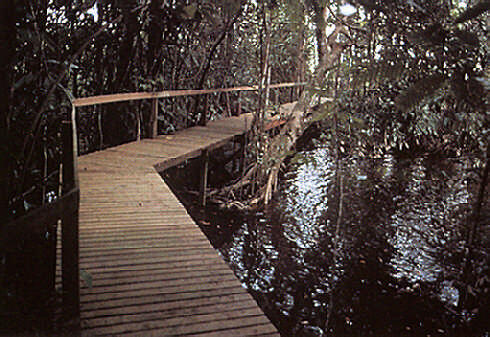 Rain forest, from which the greenheart comes, covers three-quarters of Guyana. 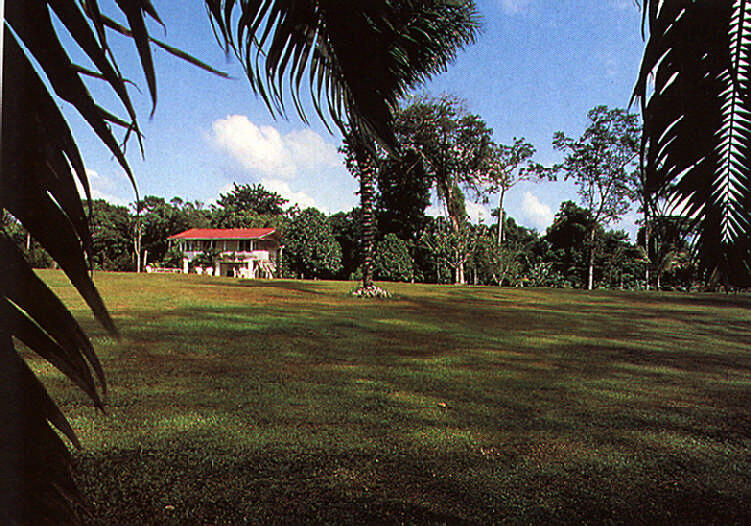 With its help, Guyana is becoming a real destination, offering a taste of sophisticated and relaxing jungle life. As you would expect, the forest is quite humid, and the thought of activity is enough to make you condense, but a walk or a canoe ride into this other world is rewarding. Flycatchers whir away with a thrum as you approach; other large and colourful birds flash by in the canopy. You can almost feel the forest breathing and growing around you, with all the fruits and leaves dropping. Guyana is of course on the South American mainland, but the Guyanese tend to think of themselves as an English-speaking island on that Hispanic continent. And after so many years as the Caribbean’s poor relation, there is now keen new interest in the country. West Indian businessmen and foreign investors are arriving in Georgetown by the planeload; Guyanese travellers are joking that they are being treated with a little more deference now. Georgetown, the capital, does still have a certain feel of neglect. But many of its wooden buildings have weathered well. 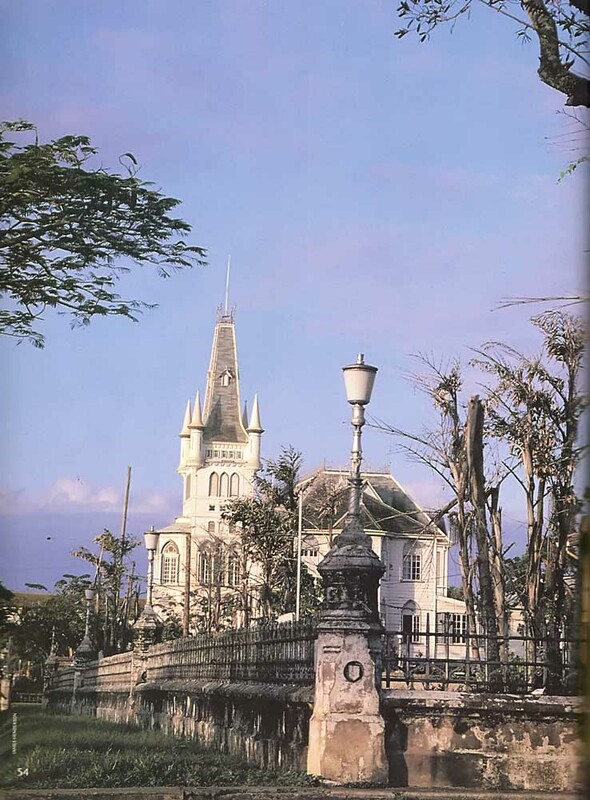 They are still the most magnificent in the Caribbean, standing on wide avenues with canals or walk-ways shaded by samaan and flamboyant trees. Their faded grandeur shows how much wealth was once created here and gives an inkling of how the country’s massive resources and energy might be harnessed once again. 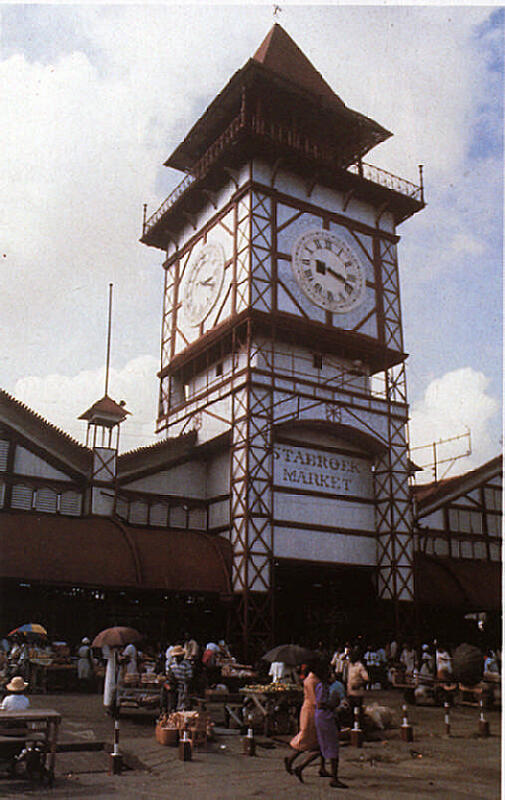 The covered market in Georgetown, Stabroek, rivals Port-au-Prince’s as the Caribbean’s most magnificent. The activity and endeavour, the banter and backchat, are just as lively. I fell in with some chick-chick players (this is a dice game not much played elsewhere) and was fleeced for $50 before I knew it. Wandering in the back of the market I found myself hustled along with a “this way, man, this way” to a water-taxi bound across the broad Demerara. 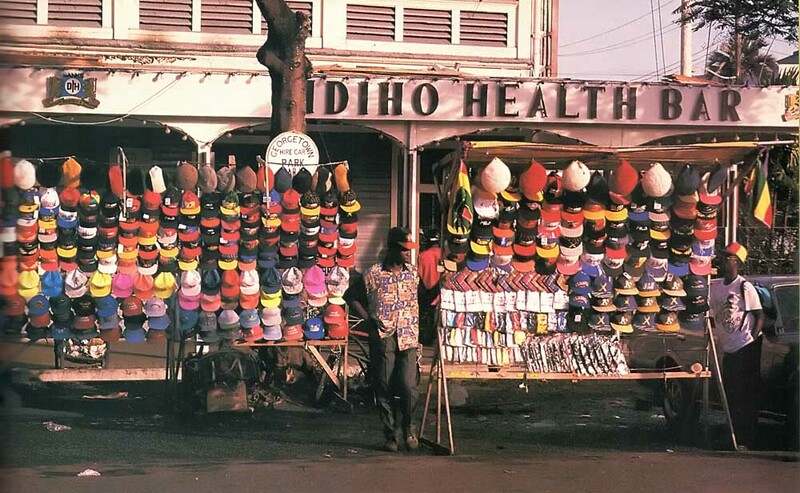 The fact that I didn’t want to go there seemed secondary; that’s market life. But going up-river in Guyana is a real option. The rain forest and mountains in the south of the country, stretching towards Brazil, produce these huge continental rivers. Near the coast they can be ten miles wide, with islands in their mouths as large as many in the Caribbean. But higher up they flow strongly through the mountains, crashing their way over spectacular falls. There are a number of falls to visit, the most famous of which is Kaieteur. It is about a hundred miles inland, on the Potaro River, two thousand feet up (at its head, at least). As the river approaches the lip of the fall, the brown water is deceptively calm; but as soon as it tips over the edge, it boils white, throwing of clouds of spray which rise in the air like thick mist. Still descending, columns of water race each other down the 740 feet (more than four times the height of Niagara) into a maelstrom of spray, exploding with jets that shoot a hundred feet into the air. Further downstream of course the flow of Guyana’s rivers is more sedate, and they are navigable from the sea. They are Guyana’s life-blood, for irrigation in the rice-paddies and plantations, and they even turn up fortunes in gold and diamonds. They are essential for transport too. People, ground provisions, logs for the saw-mills, all make their way along these vast waterways. My first impression of the Essequibo, the mightiest of Guyana’s rivers, was at 35 knots in a water-taxi, with a vantage-point about two feet above the water, which gives quite a feeling of speed. These sleek wooden launches, fitting up to 20 people in only relative discomfort, have gracefully curved bows and are based on a design from the Pomeroon River nearby. After a windswept and thumping ride, it was a relief to land at Kaow Island, where The Gazebo is another charming enclave built entirely of Guyanese wood. The octagonal veranda is fed by raised wooden walkways topped with steep-sided shingle roofs. There are seven simple rooms, each with a balcony looking out over the lawns or the river, but the centre-piece is really the line of four Berbice chairs looking out over the Essequibo, low-slung and with extended arm-rests to support your outstretched legs. There is really nothing to do but put your feet up and watch the river go by. In fact this is what you should be doing in Guyana: these chairs were invented in Berbice, Guyana’s most eastern province. There is a saw-mill on Kaow Island which is well worth visiting. Like many Guyanese mills, it works greenheart timber, which is mainly used in marine construction because the wood survives so well in water. Inside is a heady mix of fragrant fresh-cut wood and cruel industrial noise: the grinding whine of machinery and the racing scratch-scratch of the big saws. 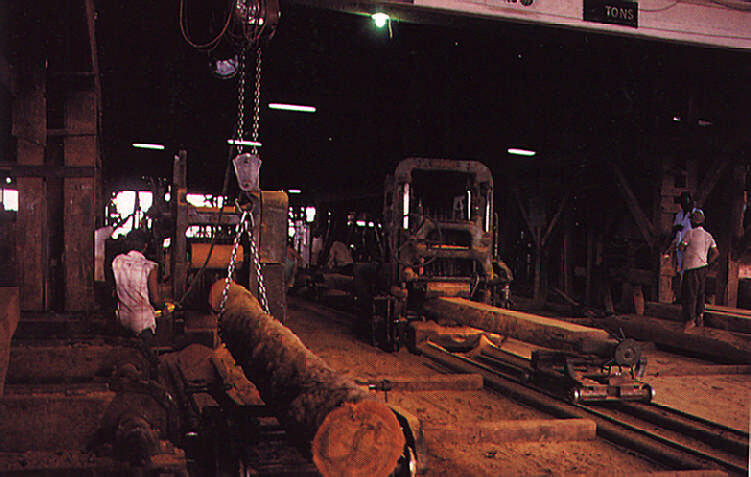 Logs are hauled around on hydraulic overhead runners fastened with huge vices and manoeuvered with vicious-looking tweezers until they end up stacked in neat piles of 3,000-pound timbers. The Kaow Island mill sends these timbers to the United States, Holland and Britain, where they last without repair for 60 or 70 years. The age of exploration and conquest is long over in the Caribbean, but Guyana still has something of a frontier feel about it in places. It is so large, and its resources are so extensive. The lure of gold, which first attracted Walter Raleigh on his quest for El Dorado, still has a hold over men. Like their forerunners four centuries ago, today’s pork-knockers, as they are known, will wager everything on the search. A traditional setting-off point for the gold-miners is Bartica, at the junction of the Cuyuni, Mazaruni and Essequibo Rivers. It still has the elements of a frontier town. You can even equip yourself with a batell (for panning), a criminal (shovel) and a sieve in several shops (NO CREDIT). The off-duty miners are there too, having sold their finds, bragging and brawling in the bars. The feeling of limitless possibility that you get in Bartica is one that comes in glimpses all over Guyana. The Guyanese, good West Indians that they are, feel certain that they are the best and know they will struggle to the top again. It is an interesting time. As for me, I spent much of my time conducting a prolonged test of the Berbice chairs, lazily wondering if there was a hungry toucan around. There wasn’t, but a more curious fate awaited me on my departure. Twiggy, the Kaow Island doberman, is happy to allow you to land, but as soon as you start to leave she goes ape. She held back; but it wouldn’t have taken much to persuade me to stay anyway.